Updated: Yesterday, we posted about 30 Pakistani websites being defaced. It’s time for retaliation from Pakistani hackers. We were just made aware of the fact that MTNL Mumbai website has now been defaced by them. Here is the mobile screenshot of the same. At the time of writing this update, the MTNL Mumbai Website is down and nothing is showing confirming the fact that it was defaced. On days like Independence and Republic days, hackers from India and Pakistan seem to go on the overdrive. It’s always a tug-of-war between both sides. Couple of days back, Pakistani hackers defaced some portion Indian Eastern Railways website. The Indian hackers have retaliated and have done it large numbers. At last count, over 30 Pakistani websites were defaced, and the this list is only partial [source]. 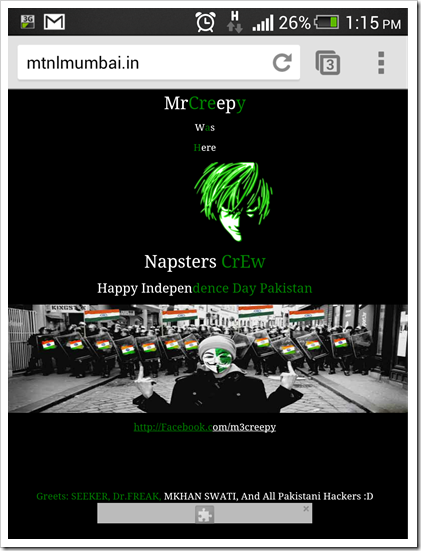 While some of the websites are back up, some websites are still showing up the defaced page by Indian hackers. Here is the message given by Indian hackers – The screenshot of defaced page from one of the websites. Note: We checked each site, and have marked the status of those websites at the time of writing this peice . If you look at the websites, it is clear that these are all small time websites, which are not maintained regularly and are easy targets for hackers. Though online forums do talk about Indian hackers getting into some Pakistani government websites, we did not find any when we checked few of them. "Updated: 30 Pakistani Websites Defaced By Indian Hackers, They Bring Down MTNL Mumbai Website! ", 5 out of 5 based on 1 ratings. What A Shame…Only IISc Ranks In Top 500 Universities In The World!